This last year hasn’t been the easiest. I lost a great part-time job, that I loved, paid me well and fitted into my life, when the company went into administration leaving me with huge debts. I was diagnosed as peri-menopausal, and in particular, struggled with brain fog and extreme fatigue – not to mention menopause weight gain. After a 22-month wait, my son was finally diagnosed as autistic. And to top it all, our brand new car was stolen off our driveway. It’s fair to say I’ve had better years. However, surprisingly I’m all OK with it. I’m obviously not jumping off rooftops, shouting about how horrendously overdrawn I am, but I’m taking it in my stride and not letting everything get me down. So what magic pill has helped me cope with it all? Well, aside from HRT and a supportive husband, family and friends, it has to be the newest addition to our family, Shyla, a husky cross. The funniest thing? We weren’t even looking for a dog. Her arrival into our life was so serendipitous. While we had been talking about the possibility of getting a dog, that’s all it was really, talk. Then my niece got in touch. She has a husky dog from a great breeder that basically re-homes any of her dogs that are no longer wanted. One cold Sunday afternoon, I received a text from my niece ‘Want a dog?’ alongside a photo of a beautiful looking pooch. 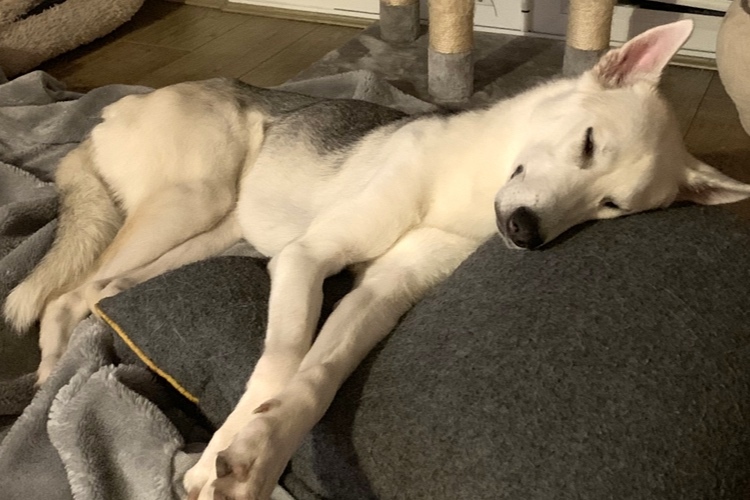 There was something about her sweet husky face and the gorgeous mix of one brown eye and one blue eye (heterochromia iridis don’t you know) that made me think perhaps… Within a week, she was with us! To begin with, I thought we’d taken on more than we could cope with. She was seriously underweight, obviously distressed that she wasn’t with her family anymore and hated loud or deep voices. To top it all off, she was also on heat – and if you’ve never experienced a husky on heat, you’re so lucky. Howling, not eating, constant clinginess, major hair loss – it wasn’t quite what I expected when we took her on. After having a mini panic attack, I bought a better vacuum cleaner, took a deep breath and realised all she needed was love, patience and company – something, as a family, we have lots of. So how has this little shepsky helped to heal me? Well first up, I’d gone from an exciting job working three days in an office, to working at home, and while jobs like writing for TGIOF have been great, I’ve really missed office banter and well, company. Now I have someone I can chat to, and while she may not understand what went down in the first episode of Line Of Duty, she does love a cuddle and a play, which helps me break up my work day. Without a doubt, my daily walks in the great outdoors have also done me a whole lot of good. I’m out and about every day, discovering new green patches, meeting new people - and dogs, of course - and enjoying the wonder of nature. The other morning when I took her out, the sun was low in the sky and among the babble of bird talk, I could hear a woodpecker furiously pecking away at a tree. It was literally liked I had walked into one of the many meditation apps I own. These things just never figured in my life pre-pooch and for once in a long time, I was truly in the present. I wasn’t worrying about the future. Or thinking back over what I could’ve done better. I should also talk here about how much fitter I feel – and I reckon I’ve lost a couple of pounds, something I’ve been struggling to do recently, what with a husband who works shifts, a small child and no free childcare on hand. It’s not just me who has reaped the benefits of outdoor rambles either – as a family we’ve been on long five mile walks through local country parks and woods we’ve never visited. My son has rediscovered a love of the great outdoors that he lost, aged four, when he left his forest nursery and his outdoor life for the indoor sedentary life of school. He’s built a den with a neighbour’s kid (with the dogs along for the fun of course), climbed huge big trees and splashed in muddy puddles. Just as an 8-year-old should be doing. Every night after school we go for a walk in our local woods where we chat about his day, laugh at Shyla trying to catch squirrela and just enjoy each other’s company without screens, homework or general family life to distract us. I’ve read lots about how dogs are great for autistic children and I can definitely say even in this short time – just over a month – Shyla has been a huge help. When Milo has a meltdown, Shyla tries to comfort him and while it doesn’t always work, he does mostly calm down quicker. He also has a little mate to play with, and as an only child, he now realises there is someone in the family who has needs, which sometimes have to be sorted before his. As I type this, she’s curled up by my side with the cat on the other side of the laptop – they have a love/hate relationship – and I can’t imagine our life without her. She wakes me up every morning with a little lick on my nose and she follows me around all day, which while a tad annoying, is also very cute. When I feel stressed about life in general or how things will pan out for my son in later life, a quick cuddle or walk on the heath helps put it all in perspective. She doesn’t judge that I’m not earning much. She doesn’t care that my son is autistic and chews everything – heck, they actually have that in common. She doesn’t care that I sometimes forget birthdays, because I’m going through the ‘mentalpause’ and can’t even remember my own name some days. Having to think of someone other than me, my family and money has been a huge, blumming relief. Her unconditional love makes me feel positive and I’m sure she and my son will go on to have many years together chewing things they shouldn’t, running in the woods and snuggling up on the sofa. Perhaps we should rename her Sunshine? After all, she’s brightened up our days so very much.